GPO Retro 'Rydell' Vintage 1950s style DAB Radio alarm clock. A design aesthetic plucked straight from a Retro Fifties home interior and bought bang up to date with the latest technology. A great gift idea, this 'Rydell' DAB Radio features a stylish Vinatge inspired carry handle, authentic dial and cool push button details. DAB Band, 20 preset stations and alarm clock function, so you can rise to the sound of your favourite radio station or the 'Rydell' buzzer. 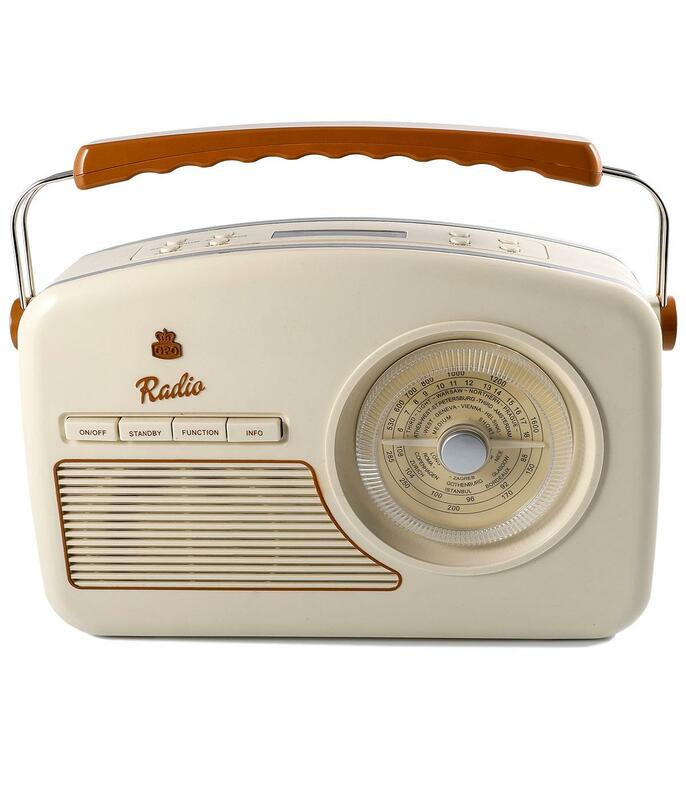 Pure Retro charm with a genuine 1950s look - 'Rydell' DAB Radio from GPO Retro. GPO Retro 'Rydell' Vintage 1950s radio in classic cream. Portable battery operation or can be plugged into the wall (UK mains supply). DAB+/DAB Band III and FM digital radio. 20 Radio stations preset (DAB10/FM10). Useful sleep and snooze function to the radio alarm clock. The clock automatically sets via DAB. Retro speaker detail and neat push buttons. Nice Vintage look carry handle. Mains adapter and user manual supplied. GPO Retro signature sign off. Comes in a nice cardboard presentation box. Key Points: GPO Retro 'Rydell' vintage style DAB Radio with carry handle. Alarm clock function. Battery and mains operated. Batteries not included. 31cm x 7cm x 27cm.